I received no advanced warning, just a message to state that I had been blocked from importing notes which was harsh. The problem appears to be the imported feed/RSS from my blog which isn't being accepted by Facebook's Importing feature. 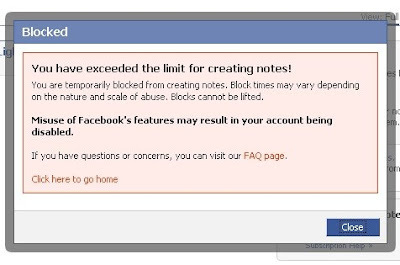 When it did eventually decide to work, Facebook imported 25 notes and then I received the message that I had been blocked from using the feature. Obviously it's a mechanism in place to stop abuse but there was no way for me to appeal and also this should not occur when it's the social networking site that set the 25 limit anyway not me. The image below shows where I enter my Public URL to import to the site, no intentional abuse on my part and no real details on how long this is expected to last!